This series was originally published at the Redbird Daily, but is now proud to call Cards Conclave home. This installment was written by Colin Garner. If you haven’t, check out the Introductory Article to gain understanding of how these rankings were built. That article can be found by clicking here. I was in a Manassas, Virginia GameStop when the Cardinals traded for Matt Holliday. I had seen Brett Wallace hit at Double-A Springfield, and he truly looked like a ferocious hitter (nevermind that he flung balls into the stands while playing catch). Obviously, I couldn’t have been more wrong. Holliday fit right in. After going 4-for-5 in his debut, he hit .353/.419/.604 with a 169 OPS+ in just over two months and was a huge factor in the Cardinals surging to the top of the NL Central. The playoffs, however, were disappointing, and if he’d signed elsewhere, it would have been a disappointing trade. Over the next seven years, Holliday was one of the best and most consistent players in the big leagues. Here are his rankings as a left-fielder from 2010 to 2016. The Cardinals tremendous success certainly played a part in the Cardinals perception of Holliday, but it’s not often that seven-year contracts look like good deals at the end of them. It was for Holliday. One thing, in my opinion, makes Holliday a fan-favorite: as much as St. Louis loved Matt Holliday, Matt Holliday loved St. Louis back just as much. In an era when Baseball Heaven has been spurned by Albert Pujols, Jason Heyward, David Price, and most recently Giancarlo Stanton, Holliday’s love for St. Louis means a hell of a lot. 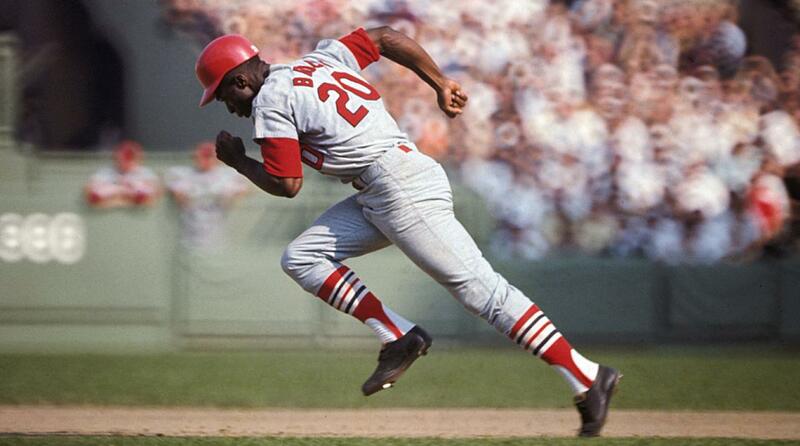 I never saw Lou Brock play, but you didn’t have to in order to understand that he was a fan favorite. Every time the red jackets come out, “LOUUUUUUUUUUUUUUU.” It’s a cliche at this point, but to outsiders, it might sound like boos for a Hall of Famer. In 1964, Brock came over in one of the most one-sided trades in baseball history and immediately played an enormous role in the first World Series title since 1946. From June 15 to the end of the season, Brock hit .348 and stole 33 bases. His tear continued in the World Series, where he hit .300 with a homer, two doubles, and five RBI’s. Over the next fifteen years, which included another World Series and pennant, Brock was a six-time All-Star, led the National League in stolen bases eight times, and set the single-season record with 118 steals in 1974. Analytics tend to downplay Brock’s career because they are skeptical of the value of the stolen base, but he’s still ranked as the 15th best left-fielder in Bill James‘ Historical Baseball Abstract. I don’t do Lou service with what I’ve written. After all, I never saw him play and his statistics don’t convey the excitement of 3,000 hits and one of the greatest base stealers of all time. Last Spring, Brock was diagnosed with cancer. Thankfully, it’s in remission. At the time, StlCardsCards wrote a piece that conveyed what Brock meant to the Cardinals. He did it far better than I have. Give it a read here. Signed as a pitcher, the Missouri native went through a position change and two years of military service before breaking into the majors. Once, there, he excelled. In just his second year he was an All-Star, and after a down year in 1957, won a Gold Glove and earned MVP votes in 1958. He had four consecutive seasons with an average over .300 from 1958-1961. In 1964, Boyer hit .295 with 24 homers and a league-leading 119 RBI’s. He won the MVP, but his contributions didn’t stop there. With the Cardinals trailing the Yankees two games to one in the series and 3-0 in the game, Boyer launched a grand slam to give the Cardinals a 4-3 lead. The bullpen hung on and the Cardinals evened the series, which they would win in seven games. Boyer was never elected to the Hall of Fame. Stan Musial, however, thought he was deserving. “The ballplayers know he’s a good one, but nobody else does”, he said. As the Cardinals pursued relief help in the winter of 2017, the point was made that they hadn’t signed a free-agent closer since Izzy. Well, that was a good move. Over seven seasons with the Cardinals, Izzy averaged over 30 saves a year, and that includes an injury-riddled 2008. In his Cardinals career, he had a sub-3.00 ERA (2.98), 217 saves, 8.2 K/9, and a 143 ERA+. Izzy is hard to write about simply because he was so good and so consistent. No, he didn’t have the peak that Eric Gagne did, the longevity of Hoffman, or the postseason pedigree of Rivera. From 2002 through September of ’06, the ninth was Izzy’s. And he was one of the best in Cardinals history at putting leads in the win column. I was really hoping this would be a “Welcome to the Hall, Simba” piece. Unfortunately, he missed by one vote. James pinpointed why Simmons is underappreciated, and it sounds right. The Cardinals weren’t a very good team in those years; they spent most of the time fighting about something and criticizing one another for their failures, and then, too Johnny Benchset an impossible standard for a young carcer; there was always a feeling that Simmons’ chance to shine would come when the Cardinals developed and Bench faded. But when the time came, Simmons’ defense had become problematic and Whitey Herzog traded him. *Fangraphs has Joe Torre ahead of him in WAR, and he is in the Hall of Fame due to his achievements as a manager. That being said, Torre was also not strictly a catcher, so the point stands.